My daughters absolutely love Chocolate Truffles. I usually make them at Christmas and cover them in cocoa powder or confectionary sugar. But today I decided to whip up a batch as a surprise for them and dip them in chocolate so the outside has a hard candy coating while the inside is rich and satiny. These are perfection! While delicious to eat, they are somewhat messy to work with, so I strongly suggest wearing a pair of kitchen gloves. If you want to flavor your truffles, you can add any liquor you would like in place of the coffee. Want to jazz up the outside of the truffle? Try putting a pinch of sea salt on top after you dip them! In a heatproof bowl, combine the bittersweet chocolate and the heavy cream. Microwave for 2 minutes and then let stand for one minute before whisking until thoroughly smooth. Add the coffee and vanilla and stir well. Place the mixture in the refrigerator for three hours. Using two teaspoons, spoon round balls of the mixture onto a parchment lined baking sheet. In the meantime, heat the 8 ounces of white or dark chocolate in a heatproof bowl in the microwave for thirty second intervals (be sure to stir every 30 seconds). Stir until completely smooth, and then wearing kitchen gloves, dip the chilled truffles in the chocolate and lay them back on the parchment. Work quickly so the truffles do not lose their chill or they will be very messy to work with. Once all the truffles are dipped, place them in the refrigerator for 30 minutes to harden. 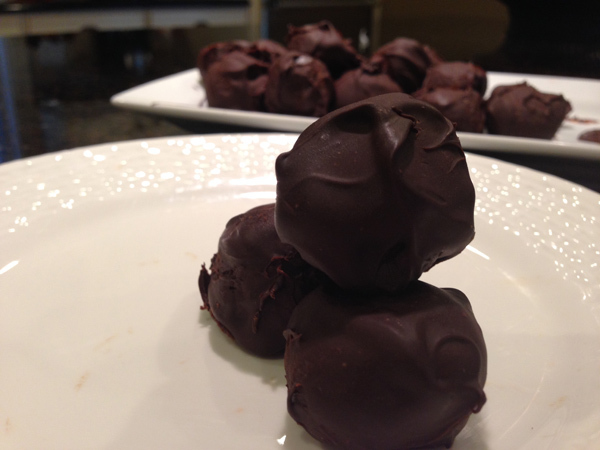 Store the truffles in the refrigerator in an airtight container between layers of waxed paper. The truffles will keep for one week.